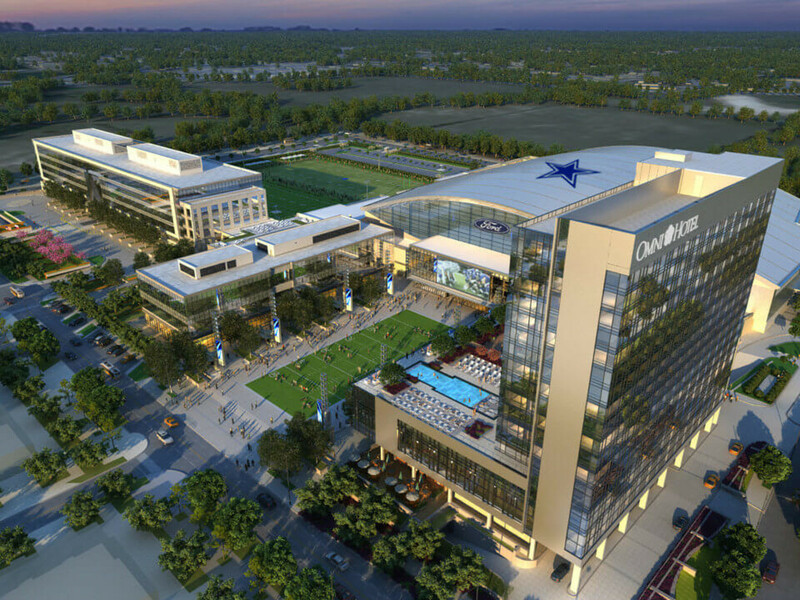 Following the grand opening of The Star in Frisco in August, the Dallas Cowboys are finally, finally unveiling their World Corporate Headquarters to the general public with tours beginning January 9, 2017. The Cowboys created their World Corporate Headquarters as a destination to allow fans to connect with the team in ways they have never imagined. Hmm. That makes the imagination run wild, doesn't it? The VIP Guided Tour gives fans a chance to experience the place where the Dallas Cowboys train and work 355 days of the year. They only get 10 days off, they're just like us. Ford Center: Ford Center at The Star is a state-of-the-art, 510,000-square-foot indoor athletic facility shared by the Dallas Cowboys, the City of Frisco, and Frisco ISD's high schools. War Room: In 2017, the NFL draft will be conducted in this new state-of-the-art War Room, designed with superior technology and a fully interactive video wall. Nike Star Walk: Sponsored by Nike, the Nike Star Walk is a collection of the 10 most significant milestones in Dallas Cowboys history, along with a display of the evolution of the team’s uniforms dating back to 1960. Possibly some Nike gear, too. Super Bowl Memorabilia & Station: Find a complete collection of memorabilia from all five Super Bowl championships, including a display of all five Super Bowl trophies and rings from the years of 1971, 1977, 1992, 1993, and 1995. Grand Atrium: The atrium boasts Italian marble floors, adorned with names and quotes of Dallas Cowboys players and coaches, as well as an LED sculpture by artist Leo Villareal called Volume Frisco (2016). This dancing LED display includes more than 19,200 white LED lights embedded in 160 40-foot-long stainless-steel mirrored rods hanging from the ceiling. The tour runs 1 hour and 15 minutes, and includes 15 people at a time. There'll be 20 tours operating daily, every 30 minutes between 9 am-7 pm. Tour stops may change to accommodate team practices, event bookings at Ford Center, and other parts of The Star, resulting in route changes. Dallas Cowboys season ticket holders can buy tickets starting December 20, during an exclusive internet-only presale event. The general public can buy tickets on December 21 at 10 am. Tickets are $32.50 for adults and $27.50 for kids, seniors, and those with a valid military ID. Group tours for 10 or more are also available at $25 per person. Tours offered in Spanish and American Sign Language will be made available upon request. To purchase tickets, visit the Ford Center ticket window or TheStarInFrisco.com/tours. To learn more, email TheStarTours@dallascowboys.net or call 972-497-4720.